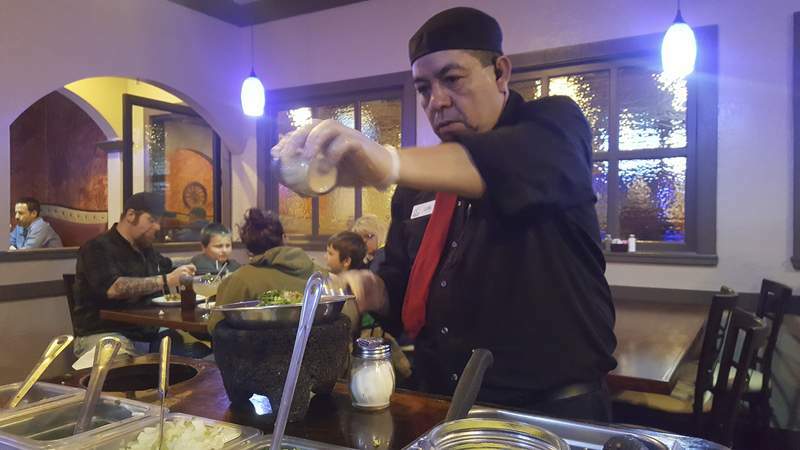 An employee makes fresh guacamole at Arco's Restaurante Mexicano on DuPont Road. 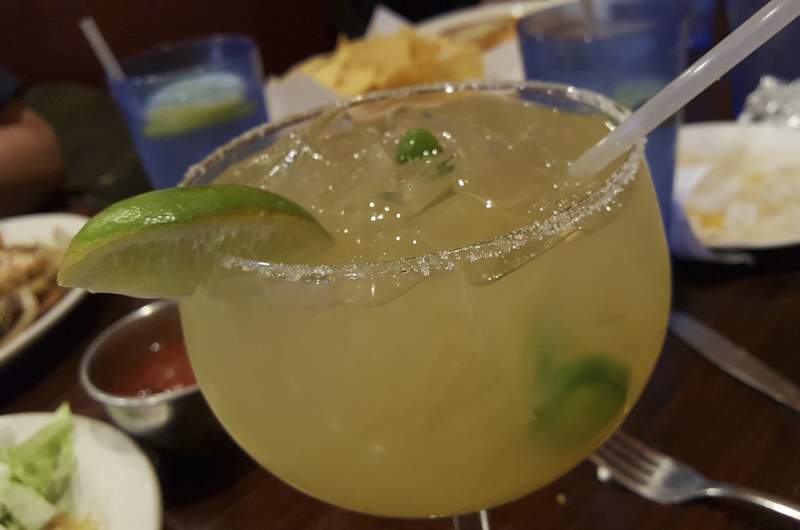 Cucumber-jalapeno margarita at Arco's Restaurante Mexicano on DuPont Road. Burrito Deluxe at Arco's Restaurante Mexicano on DuPont Road. Quesadilla Vegetarian at Arco's Restaurante Mexicano on DuPont Road. 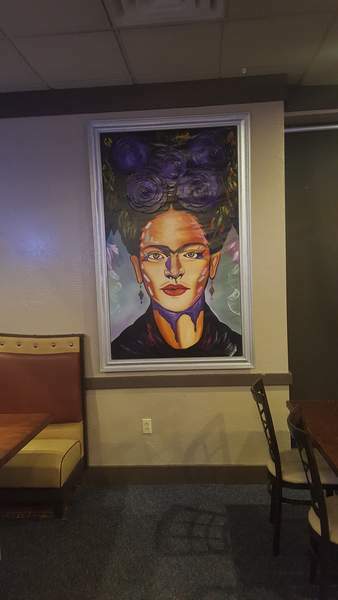 A painting of Frida Kahlo at Arco's Restaurante Mexicano on DuPont Road. 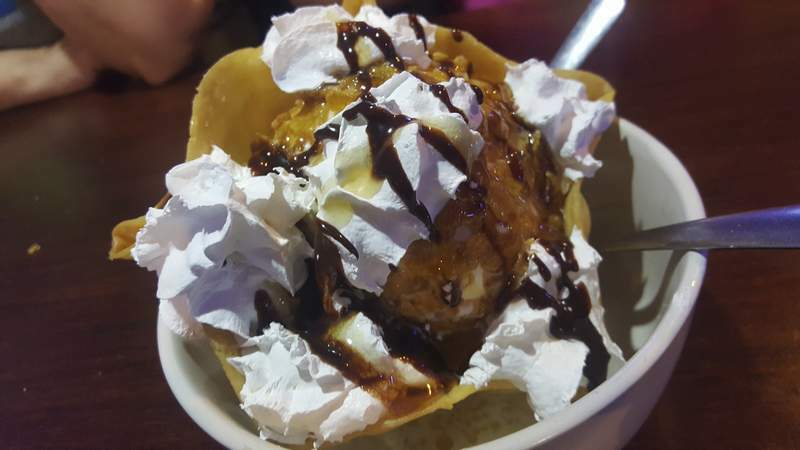 Fried ice cream at Arco's Restaurante Mexicano on DuPont Road. 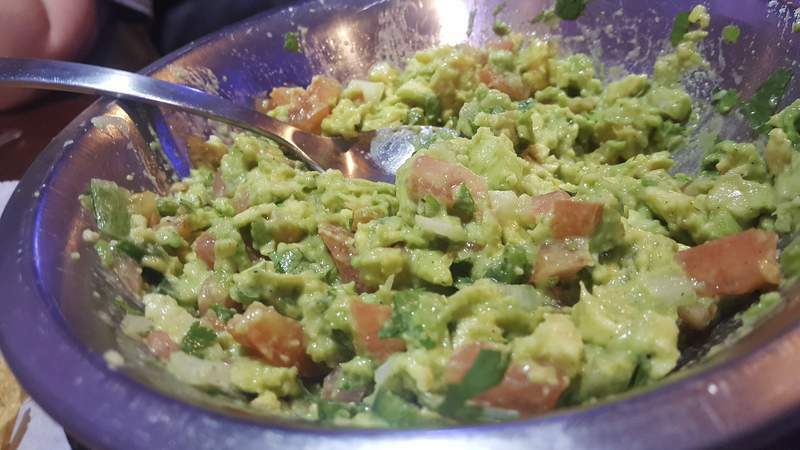 Freshly made guacamole at Arco's Restaurante Mexicano on DuPont Road. Arco's Restaurante Mexicano on DuPont Road. Sopa Azteca at Arco's Restaurante Mexicano on DuPont Road. 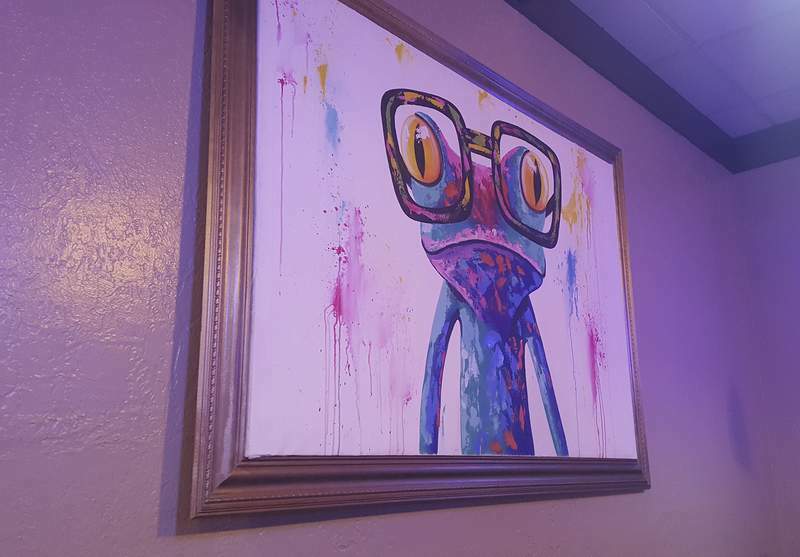 A cool frog painting at Arco's Restaurante Mexicano on DuPont Road. The bar area at Arco's Restaurante Mexicano on DuPont Road. The Fort Wayne Special at Arco's Restaurante Mexicano on DuPont Road. Flan at Arco's Restaurante Mexicano on DuPont Road. Parillada at Arco's Restaurante Mexicano on DuPont Road. 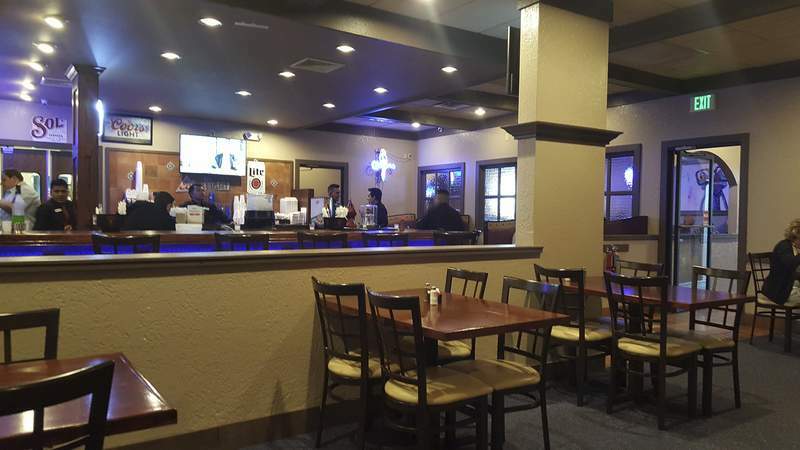 It opened quietly along Dupont Road near Interstate 69 in a space that was once home to Bandidos, and its name was one I hadn't seen before. 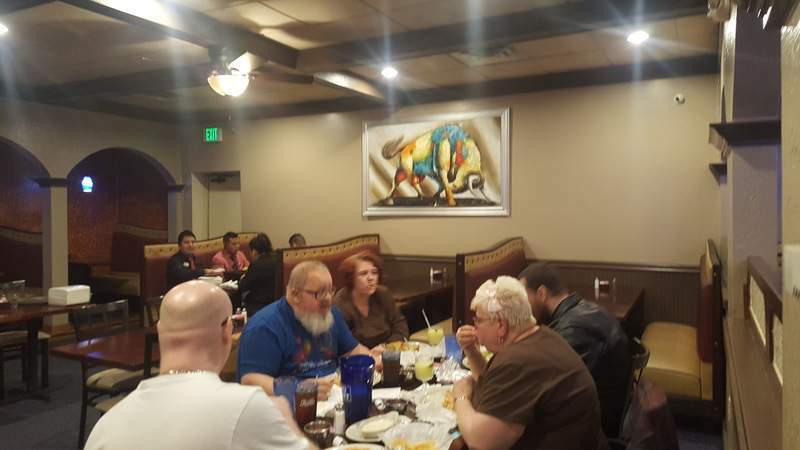 Though it was the first Arcos Restaurante Mexicano here, it was not really the first of its kind. It is part of a small group of restaurants – many with different names – in Ohio that includes stores in nearby Defiance and Payne. 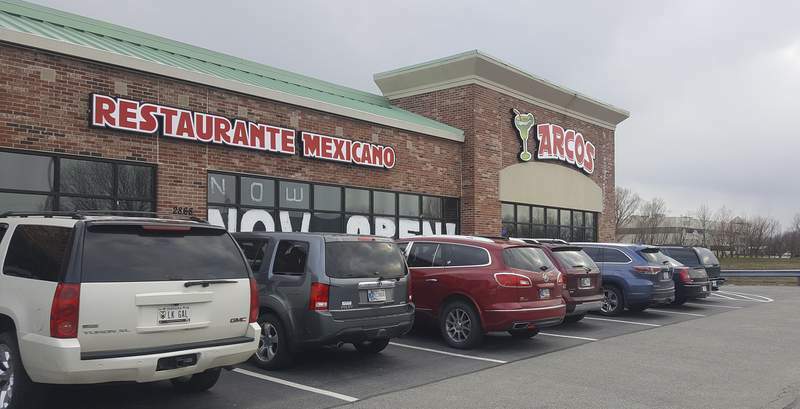 I don't know much about the other stores, but I do know Arcos is offering something different and something exciting to the Fort Wayne dining scene. Its uniqueness was apparent as soon as I walked in. 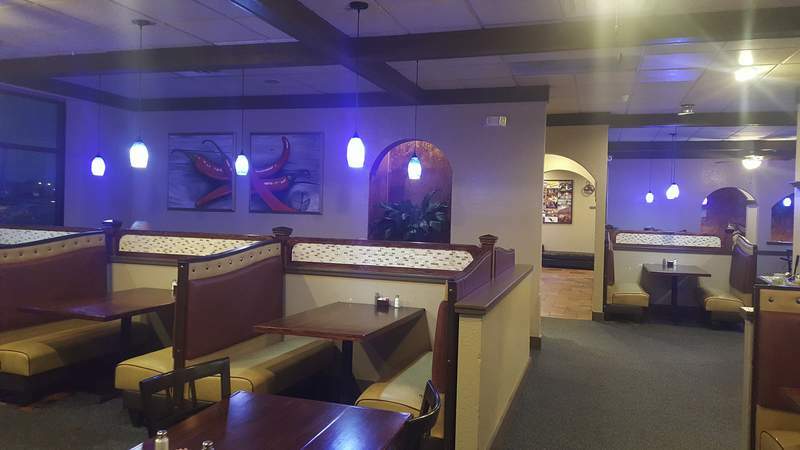 The restaurant is designed to be elegant and eye-catching without overused swag – oversized colorful chairs, sombreros on the walls and the like. The artwork is as interesting as it is beautiful. A bright colorful modern painting of a cartoonish tree frog wearing oversized glasses overlooked my table one night, and a caricature-style portrait of Frida Kahlo stared at me another. The furnishings were new and modern, and I loved the décor. My first sip of margarita proved how different the menu was. The cucumber and jalapeño margarita was about as refreshing as one of the tequila-based drinks could be. The base was fresh lime, which stood at the forefront. A handful of thinly sliced jalapeños swam in the cloudy drink and added just enough zip without forcing me to reach for another drink to tame the spice. The cucumber flavor gave it a vegetal brightness that sat in the background but snuck up on you at the end of each sip. It was brilliant. Vegetables also played a starring role in the best appetizer. Though it came with rice and beans as an entrée, I ordered the Quesadilla Vegetarian as a starter, and I will be ordering it that way again. 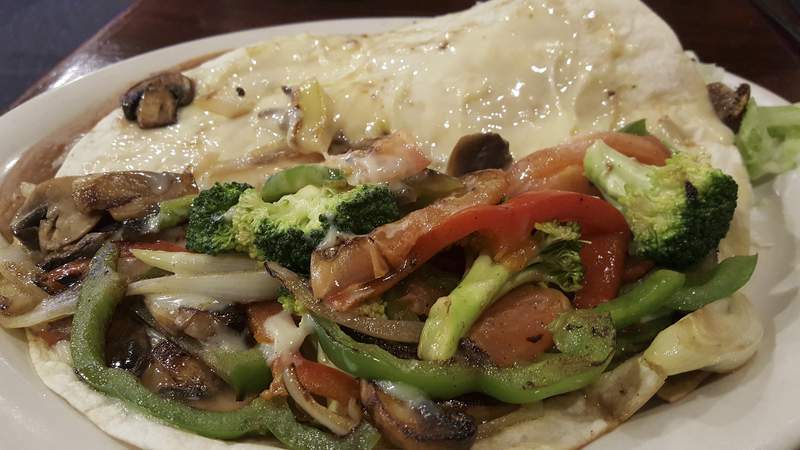 It had the usual grilled, fajita-style onions, tomatoes and peppers but was also loaded with sliced mushrooms and fresh, crunchy raw broccoli. All the vegetables were coated with white cheese that oozed like queso dip. The nicely browned flour tortilla was thick and maintained its integrity, and it was simply a perfect quesadilla. One of the most gorgeous things I ate was also an appetizer that could double as a meal. 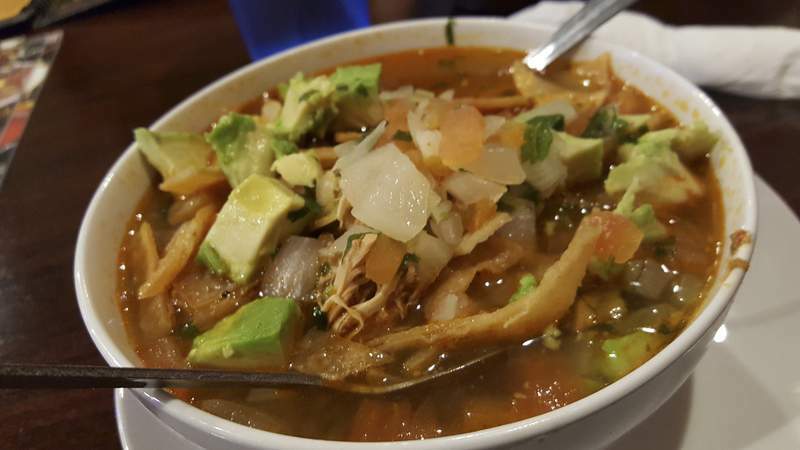 The Sopa Aztecas was a basic chicken-tortilla soup, but there was nothing basic about its appearance. My cup came in a good-sized bowl, which made me wonder how big a bowl of the soup was. It was topped with chunks of ripe, green avocado, a vibrant pico de gallo and fresh cilantro. With stringy stewed chicken, rice and tortilla strips – soft ones in the broth doubling as noodles and crispy fried ones on top – it was delightful. Another great surprise was the parrillada. 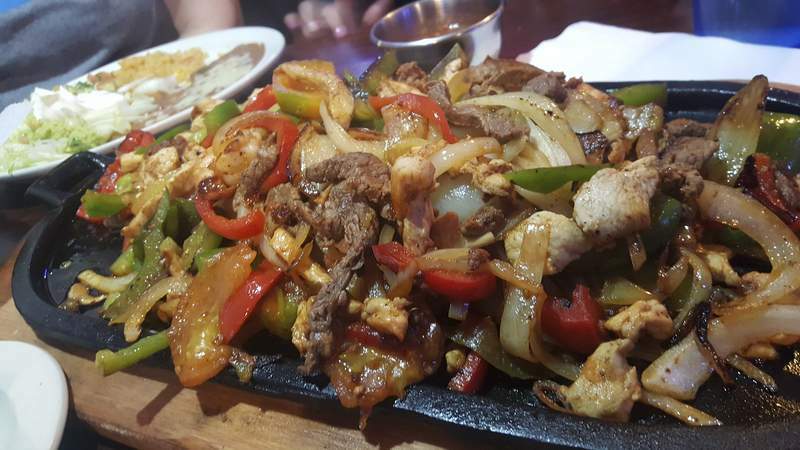 This hearty dish is basically a big, family-sized fajita with carne asada steak, chicken, shrimp, chorizo, tomatoes, onions and peppers on a sizzling skillet. I have only seen it on a couple of menus over the years, but hope more restaurants add it because it is a great dish. Arcos also offered a molcajete, which is a similar, but smaller, dish served in a heated stone bowl. I was impressed the parrillada had so many shrimp, which are kind of the prize jewels you normally have to dig around to find. The chorizo came in big chunks like meatballs so you could just as easily fill a corn tortilla with it as you could break it up to include with the other meats. The steak and chicken were up to snuff, and there were a lot of grilled onions that added a little sweetness. Cheese, sour cream, guacamole and pico de gallo were on the side. Speaking of guacamole, Arcos' freshly made tableside guacamole was yummy, as was its standard salsa, which was a tad runny but had big chunks of onion to make it interesting. I had to try the Fort Wayne Special, and it allowed me to try a tamale, two chicken flautas and chicken and ground beef nachos. 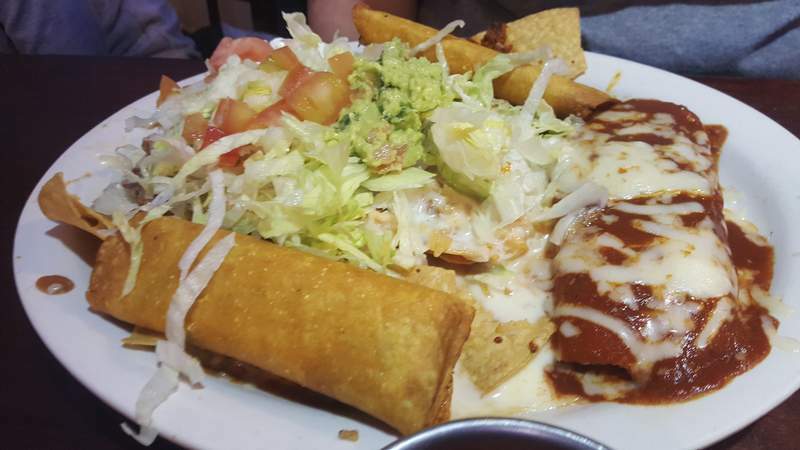 The flautas were serviceable with well-stuffed tender, juicy chicken, but the tamale was not good. It was said to have been sauced with mole, but this sauce, though a dark reddish-brown like a good mole, was acidic and somewhat sour. It was not rich and robust and did not taste like a slow-cooked mole. The nachos were decent with plenty of meat, but the ground beef was not to my liking. The sauce used to season the beef had a red color and was kind of smoky, but the flavor was odd. I found it to be much different than standard ground beef fillings at other Mexican restaurants. When masked by the chicken, cheese and other toppings on my small nachos serving, it was not so bad, but I struggled with it as part of my Burrito Deluxe, which had one ground beef and one chicken burrito. Both of these sizable, 8-inch rolls were covered with white cheese sauce, lettuce, tomatoes and sour cream. The cheese and sour cream helped tame the beef, but I still gravitated to the chicken. 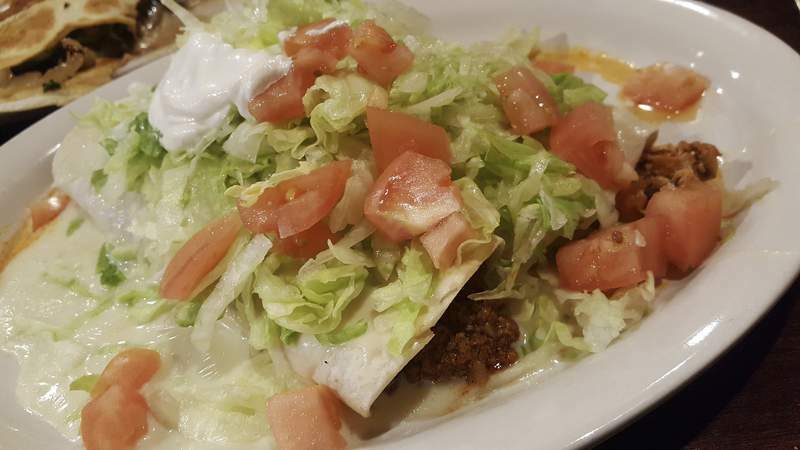 It, like the chicken in the flautas, was seasoned just right, juicy and delicious. I was surprised to find a tiny bone shard in one of my first bites and kind of happy about it because I knew the chicken was prepared with care. I was not so happy when I crunched down on three other bone fragments as I ate it, however. 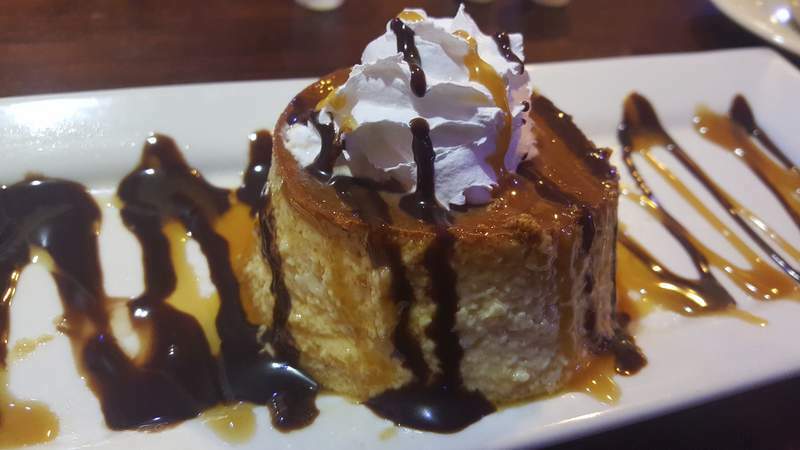 The fried ice cream was tasty at Arcos, but flan was the way to go for dessert. It was light and almost airy in texture, but still had a richness in flavor with its caramelized top and the addition of more caramel and chocolate syrup drizzled over it. The service also proved that this new restaurant is not really a rookie as it was professional in every way. And that went a long way to ensuring I would return. My servers explained everything perfectly, I was checked on by members of the management team during every visit, and those folks were quite friendly down to asking each person in my party their name and shaking their hands.